We encourage you to join us on Thursday, April 4th from 11:00am – 12:00pm in the Academic West Event Lounge on the 1st floor for a Pizza and Policy Plus. 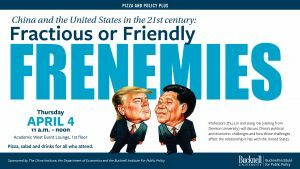 Professors Zhu, Lin and Jiang ’06 (visiting from Denison University) will discuss China’s political and economic challenges and how those challenges affect the relationship it has with the United States. Pizza, salad and beverages provided for all who attend.